Channing Frye joins the show to discuss if Anthony Davis will stay in New Orleans, whether Kyrie Irving is the best 1-on-1 player, and the state of the Warriors locker room. 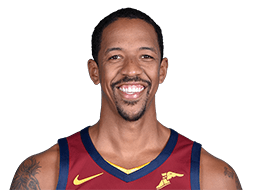 Channing Frye is tackled by Cavaliers teammates on the sidelines as he checks out of his final home game for the Cavaliers. Justise Winslow led the Heat with 24 points as they got the win over the Cavs, 118-94. Giannis Antetokounmpo leads all scoring with 44 points to go along with 14 rebounds as the Bucks get the win over the Cavaliers, 114-102. Jordan Clarkson comes off the bench to score 28 points and grab five rebounds as the Cavaliers drop the Knicks, 113-106. Andre Drummond and Blake Griffin score 26 points a piece, Drummond adds 22 rebounds as the Pistons defeat the Cavaliers, 110-103. Jae Crowder whips the pass to Channing Frye for the slam dunk. Miami gets the steal and Justise Winslow goes for the block but Channing Frye is there for the rejection at the glass. Played in 70 games (32 starts) with Orlando and Cleveland…averaged 6.0 points on .436 shooting, including .387 from three-point territory, and 3.3 rebounds in 17.1 minutes…played in 26 games with the Cavaliers (three starts), averaging 7.5 points on .438 shooting, including .377 from deep, and 3.6 rebounds in 17.2 minutes…in 44 games with the Magic (29 starts), averaged 5.2 points on .435 shooting, including .397 from beyond the arc, and 3.2 rebounds in 17.1 minutes…shot .387 from three-point territory (30th-best in the NBA), the third-best three-point shooting percentage of his career…scored in double figures 17 times…from March 10-18, averaged 14.2 points on .667 shooting (26-39), .643 from deep (18-28) and 4.0 rebounds in 20.4 minutes…grabbed five or more rebounds on 18 occasions…knocked down two or more three-pointers in 22 games, including six games with four or more treys and three contests with five three-pointers…swiped a season-high three steals twice (Dec. 3 at Utah and Dec. 20 vs. Atlanta)…dished out a season-high five assists on two occasions (Dec. 14 at Brooklyn and Dec. 28 vs. New Orleans)…tied his career high in blocks with four on Jan. 14 versus Toronto…poured in a season-high 21 points on 8-10 (.800) shooting, including a season-high tying 5-7 (.714) shots from deep, seven rebounds and one steal in 24 minutes as a starter against the Lakers on March 10…pulled down a season-high eight rebounds on two occasions (Nov. 9 at Indiana and March 31 vs. Brooklyn)…went 5-10 (.500) from the field, including 3-6 (.500) from beyond the arc, for 13 points to go along with a season-high tying eight rebounds and two assists in 23 minutes against Brooklyn on March 31…swiped his 400th career steal on April 13 versus Detroit; finished with 14 points on 6-10 (.600) shooting, six rebounds, four assists and one steal in a season-high 41 minutes…led or tied for the team lead in rebounds once, steals on three occasions and blocks three times…was a DNP-CD eight times this season with Orlando and twice with Cleveland. Has appeared in 727 career regular season games (423 starts) with New York, Portland, Phoenix, Orlando and Cleveland and owns career averages of 9.2 points and 4.8 rebounds in 23.9 minutes per game…also shooting .439 from the field, .386 from three-point range and 819 from the free throw line…played in 75 games (51 starts) with Orlando in 2014-15…averaged 7.3 points, 3.9 rebounds and 1.3 assists in 24.9 minutes, while shooting a team-high .393 (136-346) from three-point range…as a starter, averaged 8.5 points, 4.5 rebounds and 1.4 assists in 28.9 minutes...ranked 18th in the NBA in three-point FG percentage…led (or tied) the team in rebounding twice and in assists once…scored in double figures 23 times and 20+ points once, including a season-high 22 points on Mar. 6 vs. Sacramento…recorded two double-doubles…pulled down a season-high 11 rebounds on Nov. 5 at Philadelphia…recorded at least one blocked shot 28 times and had two-or-more blocks nine times, including a season-high three blocks three times, the last on Mar. 6 vs. Sacramento…recorded at least one steal 35 times and had two-or-more steals 10 times, including a season-high three steals on Nov. 14 vs. Milwaukee and Jan. 18 vs. Oklahoma City…missed two games due to injury/illness: missed one game (Oct. 28) due to a sprained left MCL and one game (Mar. 22) due to an illness…DNP-CD five times…played and started in all 82 games with Phoenix in 2013-14…averaged 11.1 points, 5.1 rebounds and 1.2 assists in 28.2 minutes, while shooting .370 (160-432) from three-point range…became the ninth player in Suns history to start all 82 games in a regular season and the first since Amar’e Stoudemire in 2009-10...led (or tied) the team in scoring five times and in rebounding six times…scored in double figures 57 times and had 20+ points 11 times, including a season-high 30 points on Jan. 19 vs. Denver…in 2012-13, sat out the entire regular season after he was discovered to have developed a dilated cardiomyopathy, also known as an enlarged heart, due to a virus…it was discovered during a screening echocardiogram conducted as part of a routine physical…played in 64 games (59 starts)with Phoenix in 2011-12, averaging 10.5 points, 5.9 rebounds, 1.4 assists and 1.09 blocks. in 26.1 minutes….shot .890 (73-82) from the free throw line…pulled down a career-high 16 rebounds on Dec. 30 at New Orleans…dished out a career-best seven assists on Jan. 13 vs. New Jersey…recorded a career-high-tying four blocked shots on Apr. 3 at Sacramento…missed the final two games after suffering a subluxed right shoulder…underwent surgery on May 2...in 2010-11, appeared in 77 games (64 starts) with Phoenix, averaging a career-high 12.7 points, a career-best 6.7 rebounds, 1.2 assists and 1.03 blocks…in a career-high 33.0 minutes., while shooting .390 (171-439) from three-point range and .832 (89-107) from the free throw line…scored a career-high 33 points on Apr. 11 vs. Minnesota…made a franchise-record-tying nine three-pointers on Apr. 11…set a team record for most three-point field goals made in a half with seven during the second half on Dec. 15 vs. Minnesota…made the game-winning 23-footer at the buzzer to give the Suns an overtime win on Feb. 27 at Indiana…yhe very next night, he hit the game-winning three-pointer with 6.6 seconds left on Feb. 28 at New Jersey…On Mar. 22 vs. L.A. Lakers, sank three free throws with 1.1 seconds remaining to force double overtime…Suffered a dislocated right shoulder on Mar. 6, forcing him to miss five games…played in 81 games (41 starts) with Phoenix in 2009-10…averaged 11.2 points, 5.3 rebounds and 1.4 assists in 27.0 minutes…shot a career-high .439 (172-392) from three-point range and .810 (98-121) from the free throw line…his 172 three-pointers made were the fourth-most in the NBA…registered the largest increase in three-point field goals made from one season to the next in NBA history (minimum 50 games played), going from 11 trifectas in 2008-09 to a team-leading 172…recorded a career-high four steals on Jan. 5 at Sacramento…participated in the Foot Locker Three Point Shootout at NBA All-Star Weekend in Dallas…also played in 16 playoff games, averaging 8.2 points and 5.6 rebounds in 27.1 minutes, helping the Suns reach the Western Conference Finals…in 2008-09, appeared in 63 games (one start) with Portland…averaged 4.2 points and 2.2 rebounds in 11.8 minutes…played in 78 games (20 starts) with Portland in 2007-08…averaged 6.8 points and 4.5 rebounds in 17.2 minutes…appeared in 72 games (59 starts) with New York in 2006-07…averaged 9.5 points and 5.5 rebounds in 26.3 minutes…appeared in 65 games (14 starts) during his rookie campaign with New York in 2005-06…averaged 12.3 points and 5.8 rebounds in 24.2 minutes….named to the NBA All-Rookie First Team and finished fifth in the Rookie of the Year voting…earned NBA Eastern Conference Rookie of the Month honors in November. Has appeared in 37 career postseason games with averages of 6.9 points and 3.6 rebounds in 19.1 minutes…also shooting .424 from beyond the arc and .885 from the free throw line…played in 17 games during Cleveland’s championship run in the 2016 Playoffs…averaged 6.7 points on .594 shooting from the field and 2.4 rebounds in 13.9 minutes per game…also led all postseason players in three-point field goal percentage (.565, 26-46)…in the Conference Semifinals against Atlanta, averaged 13.8 points on a team-high .645 (20-31) shooting, including .579 (11-19) from deep, and 3.3 rebounds in 19.3 minutes…shot a postseason-best 10-13 (.769) from the field, including a playoff career-high 7-9 (.778) from three-point territory and finished with a playoff career-high 27 points, seven rebounds and one steal in 28 minutes during Game 3 of the semifinals at Atlanta on May 6…in the Eastern Conference Finals versus Toronto, averaged 9.0 points on .625 shooting, including .583 from deep, and 3.3 rebounds in 16.5 minutes…helped Phoenix reach the Western Conference Finals during the 2010 Playoffs…played in 16 games and averaged 8.2 points and 5.5 rebounds in 27.2 minutes per game…tallied a playoff career-high 20 points on 7-11 (.636) shooting, including 3-5 (.600) from the three-point line, and eight rebounds in 27 minutes against Portland in Game 5 of the First Round on April 26…posted two double-doubles against the Lakers in the Western Conference Finals, including 12 points and a playoff career-high 13 rebounds in 40 minutes in Game 6 on May 29…appeared in four games for Portland in the 2009 Playoffs…averaged 3.0 points in 9.0 minutes per game. NBA Champion (2016)…NBA All-Rookie First Team (2006). Full name is Channing Thomas Frye...He and his wife, Lauren, have a son, Hendrix (born Oct. 2010), and a daughter, Margaux (born April 2012)…son of Thomas and Karen Frye…his father is co-founder and co-president of Education Solutions and Services, which offers office support to public and private charter schools…his mother is a former Emmy-winning reporter and producer for Phoenix’s Channel 12 and CEO of Southwest Dimensions, who now has her own sports podcast for women, “KFrye and Girlfriends Talk Sports”…First cousin of Magic forward Tobias Harris…Their maternal grandfather, John Mulzac, was a member of the legendary Tuskegee Airmen during World War II…In January 2010, became the first boys’ basketball player in St. Mary’s High School history in Phoenix to have his jersey retired… Established the C. Frye Foundation in 2007, dedicated to teaching youth how to strive for their personal best and to create a healthy lifestyle through exercise, nutrition, support systems and respect…Hosts annual kickball tournament in Portland, where he makes his off-season home, called “Kicks for Kids” with the proceeds going to help disadvantaged youth get active by sending them on outdoor trips…Also hosts basketball leadership camps and instructional youth clinics…One of the league’s “greenest” athletes, he started the C. Frye “Go Green Team,” which educates and encourages organizations, schools and gyms to reduce their carbon footprint and increase recycling efforts…While a member of the Knicks, arranged a series of charity walks throughout New York to benefit multiple sclerosis in April 2006…Hobbies include fishing, listening to music and reading…Credits yoga with improving both his mental and physical health following the diagnosis of his dilated cardiomyopathy.